Over time and for various reason lawns can become tired, thin and patchy. This situation can be improved with an overseed of the lawn. 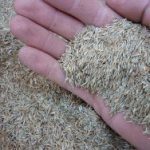 Normally carried out after a heavy scarification, overseeding allows you the opportunity to introduce stronger, drought resilient, disease resistant and more attractive seed varieties into your lawn. The best time to over-seed a lawn is straight after a heavy scarification treatment in the autumn. This is when the lawn will be at its thinnest and the soil will be exposed, planting the seed most effectively and giving it the best chance of germination. Then, the new grass plant will get lots of autumn moisture to develop, and then sit there putting down a good root structure throughout the winter, without being disturbed. It will then have a great head start when the growing season kicks off in the spring. Lawns in shady spots often suffer from lack of colour, thinness and patchiness. To treat this condition “shade tolerant” seed varieties can be introduced into your lawn to improve its ability to cope with the shaded conditions. These varieties are specially bred to be able to grow with less light available to them. Some lawn grasses are very prone to fungal diseases. Overseeding these weak grasses with a more suitable, tougher grass will help build up resistance in the lawn and keep it more presentable during the year. There are now specific disease resistant modern varieties of grass seed which can help combat annual fungal problems, such as red thread lawn disease. Injecting new, more suitable grass into your lawn will thicken it and help it to resist disease and drought. It will give it a more even colour all over. Improve the wear, and tolerance to shade and drought by increasing the variety of grass. Helps to thicken older, tired lawns. Helps it to recover from scarification treatments much more quickly. Results maybe sporadic in very hot or very cold weather. You may need to water your lawn to help the new grass germinate. You should try to stay off seeded areas for at least a couple of weeks. You can overseed your lawn with new grass in either the spring or autumn, however autumn is the most recommended, to give the grass a good long winter season to establish. Overseeding can be done in most weather, however it is much easier to do on a calm, dry day, so that the seed is distributed easily. It does clump in the rain and get blown in the wind. 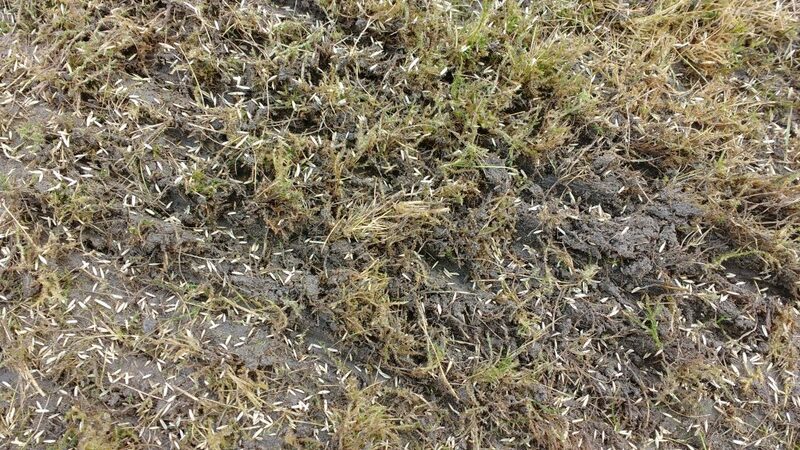 Ideally, some rain soon after will get the germination of the new grass off to a great start. It is best not applied during a drought, unless you are able to water the new seed regularly. You can over-seed your lawn without any prior preparation, however it is recommended to scarify your lawn first, which will open up the sward, getting down to the soil and give the grass the best chance of germinating and thriving. Some weedkillers will inhibit grass seed germination, so I recommend leaving at least six weeks between overseeding and applying any selective weed control treatment. This does depend on the size of your lawn, but it does not take very long to overseed and to work the seed into the lawn. This treatment does not produce any waste. It is important that new grass is kept moist after any lawn re-seeding. If if does not rain, It is strongly recommend to water the area with a sprinkler at least twice a day, for ten minutes each time, for at least the first three weeks after overseeding. However, do not allow the water to pool, just lightly wet. Top dressing the lawn after overseeding is a good way to improve the chance of good seed germination. A total weed control can also be applied to the lawn prior to overseeding to kill off existing grass. This can help to keep weed grasses at bay. However, this method will increase the length of time your lawn takes to recover.